Pests, as unwanted plants, animals, insects germs or other organisms, are not desired in any habitat in your house due how they can interfere with any human or animal activity. Also, they can give you serious trouble if it is not dealt with in time. As soon as you can get evidence of having a pest in your home, you need to contact a pest control company as quickly as possible. In Arizona, Varsity Termite and Pest Control has the fastest response in pest controls so don’t hesitate to give us a call and ask us about any of our services. We guarantee to be the best pest control company with the most affordable prices on the market. If you want to take care of your pest, there are ways to do it in a proactive way or in a reactive way. People that choose the proactive way are the homeowners that check regularly every corner of their house to prevent any sign of pest infestation. 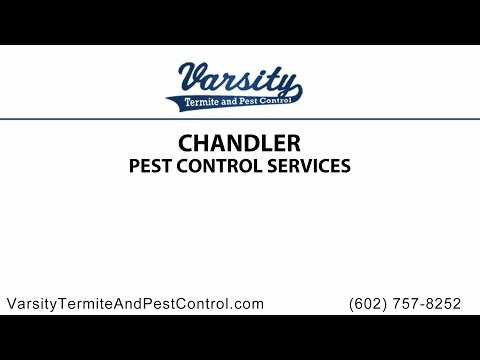 The ones that use the reactive way just wait for a sign of an infestation to call a pest control company in Chandler. I this blog, we will show you what can happen if you ignore and don’t take care of the peril of having a pest infestation. We recommend you to contact us as soon as possible to help your house and your family stay healthy all the time, as pests can also bring allergies and infectious diseases. RATS: When people talk about pests, they always relate them to bugs, but there also exists rat infestation. If you ask yourself, why does a rat can choose my home as a habitat to procreate? The answer is simple; rats are attracted by food sources and even garbage in our home and neighborhood, so don’t forget to let the garbage truck take away all the garbage you may have. Also, houses usually have small weak points that are used by these creatures as an easy access and enough space for them to create a breeding environment, like an attic. Rats tend to have a fast rate of reproduction so once they explode in population, they will start to chew your electrical wiring, damage your furniture and even leave claw marks on all your walls. This can escalate quickly, so if you see a rat in our house, you can reach us out and ask for a house inspection. Did we tell you that rats can carry diseases like Salmonella and Borrelia Bacteria? TERMITES: Being one of the most common infestations in Arizona, termites tend to live in underground areas, including dark places in your house. They live from the cellulose of wood, so if your house has anything made out of this material, they will go for it and chew it. Once they finish with wood, they can go for paper. Watch out for your books! We suggest you hire a termite control company in Chandler because if this is not taken care of fast enough, some parts of your house can collapse if termites manage to damage their support beams. SCORPIONS: Also known for being in Arizona, these little bugs can pack a strong sting! Don’t worry, it’s not dangerous for humans. The really poisonous ones live on another continent. They can have easy access to your house trough small gaps and can be found in garbage bags, stored boxes, old wood, shoes, wall openings and sometimes in the attic. If you don’t have an infestation that can hurt you while you sleep, don’t hesitate so look for someone that can help you on our scorpion control in Chandler, like us! Remember that besides these threats, there can also be pests of cockroaches, spiders, ants and even pigeons! Varsity Termite and Pest Control is ready to assist you anytime you need a pest control company. We have over 20 years of experience, built on awesome referrals from our satisfied customers who know that we provide them with the most honest and reliable pest control service in Chandler! All of our services are performed by licensed technicians trained in the latest and very best service methods. We guarantee to leave you satisfied with all the jobs we can do for you.